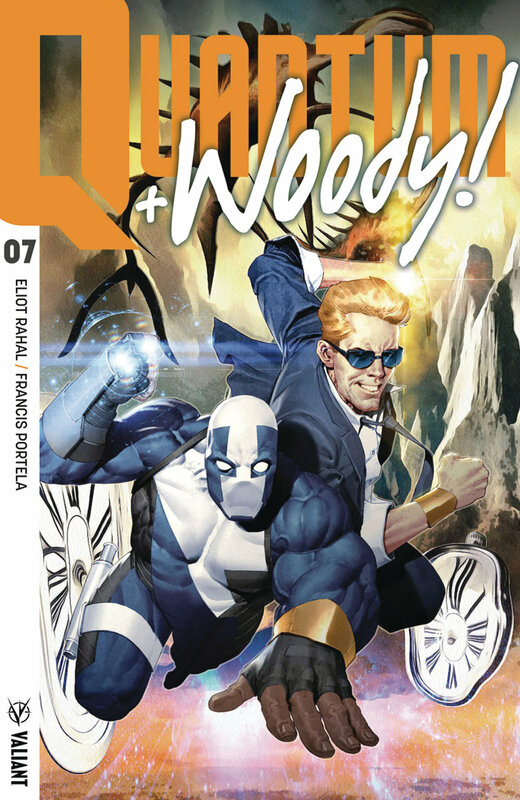 Quantum and Woody #7 is a bold issue. By Zack Quaintance — Quantum and Woody! #7 makes a lot of bold choices, the majority of which work. It's the second issue of new writer Eliot Rahal’s run, and whereas last issue was a heart-felt full-blown superhero action romp, complete with what felt like urgent and high stakes, this issue is a trip into Woody’s psyche, with a splash of Quantum’s mind thrown in, too. I absolutely loved Quantum and Woody! #6, which I came away from with huge expectations for where Rahal and team would take this book. While this next issue did nothing to dampen my excitement, it did lack a bit of the compressed sense of purpose of its predecessor. This is, by design, a more mindful issue, one that is almost entirely about fears in the context of character growth. It compliments last issue, which saw the guys both decide to face great danger without their powers, but it’s not nearly as easy of a read as its predecessor. This, I suppose, is just a necessary effect of setting the bar so high at the start of the run while also laying pipe for the future. Don't get me wrong, this is still a very strong comic. Rahal has said that as his run progresses he’ll get back to the humor that marked his predecessor Daniel Kibblesmith’s run, which is good because humor is largely what this franchise is known for. Rahal is a funny guy, too, and there are hints of that in the way Woody banters with those around him. Francis Portela also does an excellent job illustrating the ideas in this script, making scenes ethereal and dreamlike around the characters when the story calls for blurring reality. Perhaps the biggest strength of this particular issue though is where it leaves its heroes at the end: tangled together and presumably ready to combine forces yet again to overcome a shared problem, whether they want to or not. Basically, like all good Quantum and Woody stories, the heart of this one is the past and present dynamic between the two lead characters. Looking forward, Rahal seems driven to do big things with this book. The ambition of this issue, as I said earlier, is incredibly bold, almost daring, and he's shown in his other work (Cult Classic, The Paybacks) that he's more than capable of executing ambitious visions. That said, I know I’m personally on board as long as he’s writing this book.